Boomstick Comics » Blog Archive » Find Out What’s In Store For ‘The Ricky Gervais Show’ In May!!! I’m psyched that Karl, Ricky, and Stephen are back for another season of ‘The Ricky Gervais show on HBO. If you haven’t caught this series yet, I implore you to do so. It will make you cackle with laughter. 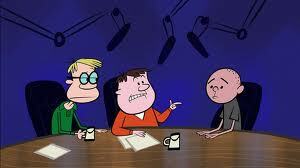 Here’s a little taste of the May of episodes of ‘The Ricky Gervais Show’. Karl learns from Ricky that he is very popular among members of the armed services and recounts how, as a kid, he looked up to his older brother, who was in the army, and longed to join himself because he made his bed so neatly. Also, Karl describes a harrowing day when he defended a pie from a bank robber, among other acts of bravery. Ricky suggests they play “Room 102,” a take on George Orwell’s Room 101 from “1984,” and asks Karl what he would banish to Room 102 forever. Also, Karl shares his idea for keeping overweight people from eating in the middle of the night, and chooses the one item he would take with him if stranded on a desert island. After Karl insists that he is really a happy-go-lucky guy at heart, spending most of his time home alone on DIY projects, Ricky and Stephen ask him to take them through a typical day in his life. Ricky, Stephen and Karl take turns describing the quintessential Englishman, and Karl explains why, if he could be any nationality other than English, he’d choose to be Italian. This entry was posted on Wednesday, April 25th, 2012 at 4:24 pm	and is filed under News, Television. You can follow any responses to this entry through the RSS 2.0 feed. You can skip to the end and leave a response. Pinging is currently not allowed. I like this concept alot, I like the Karl Pilkington aiamitnon, it suits him, but the Steve Merchant and Ricky Gervais characters could have contained alot more Um Character?! All three of them make great cartoon characters, especially Merchants lanky self.? Dunno, just think they let the side down. To see Gervais’s pointy teeth laughing away, and his annoyance with Karl would have been better. Altho I am loving the cut away stuff. « HBO Renews ‘Real Time With Bill Maher for Two More Seasons!!! You love your sister? You make any noise, you know what happens. I'm gonna kill her instead of you. Understand?